The primary goal of Emory’s Mock Trial Society is to foster and develop practical litigation skills through participation in workshops and competitions. Each year, a select number of students from the first year class are invited to join Emory Law’s Mock Trial Society. Students are chosen based on their aptitude in advocacy and trial skills. 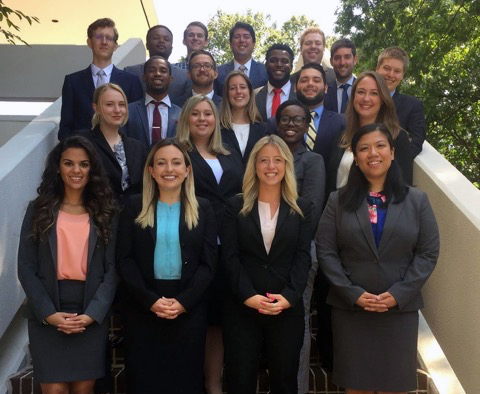 Throughout the remainder of their law school careers, these students compete in local, regional, and national mock trial competitions. They perform as advocates as well as play witness roles. In addition, each third year member acts as a mentor and coach to incoming society members. Faculty policy states other students and student organizations may not use the Emory name in connection with a publication or interschool competition team without the consent of the Dean's office. The law school maintains an active interest in any function held on or off campus in which the name of Emory Law School is used. The Emory Mock Trial Society gratefully accepts all donations to cover the expenses of sending over twenty students to competitions around the country. Use our convenient online giving form: choose "law school" and "other purpose," then add "Emory Law Mock Trial" in the space provided. Thank you for your support! If you have any questions or requests, please contact the Emory Mock Trial Society Director. You may also send regular mail to the Emory Mock Trial Society at Emory University School of Law, Emory Mock Trial Society, 1301 Clifton Road NE, Atlanta, Georgia 30322.